Regardless of who your company’s org chart says you should work with, people work with the people they want to work with and around those they don’t. One way to get people working with you (by choice) is to get to know your coworkers better, and I don’t mean personally. Most people don’t know the people they work with very well. Coworkers often don’t know what fellow team members are tasked with doing for the company, their past work experience, education, or working style preferences. They often don’t know how fellow team members like to receive information, but get annoyed when they don’t return unopened emails. If you’ve had any team building training with me, you know I advocate getting to know people better by asking more questions. Organizations spend a lot of money on team building. 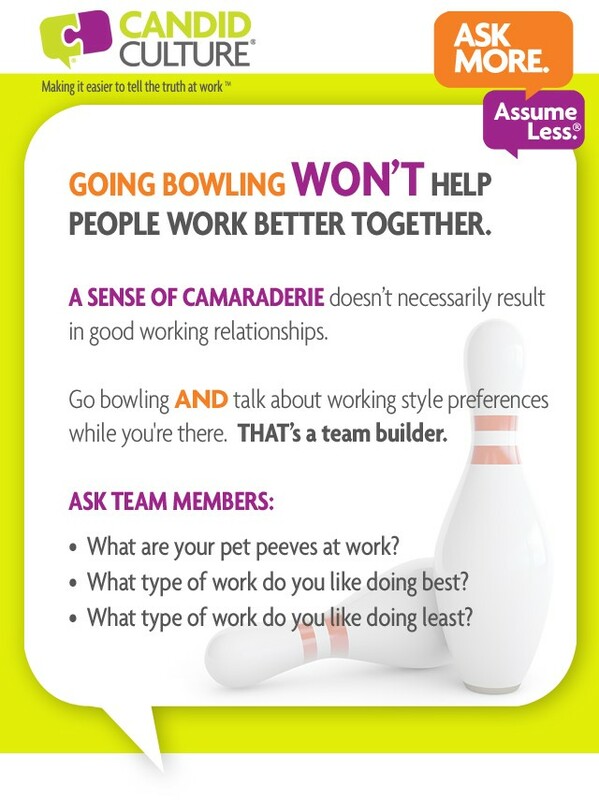 Teams go bowling, out to happy hour, and have pot luck lunches, etc. All of those activities are fun and build comradery, and that’s important. But comradery and enjoying spending time together outside of work won’t help a team learn to communicate or overcome challenges. 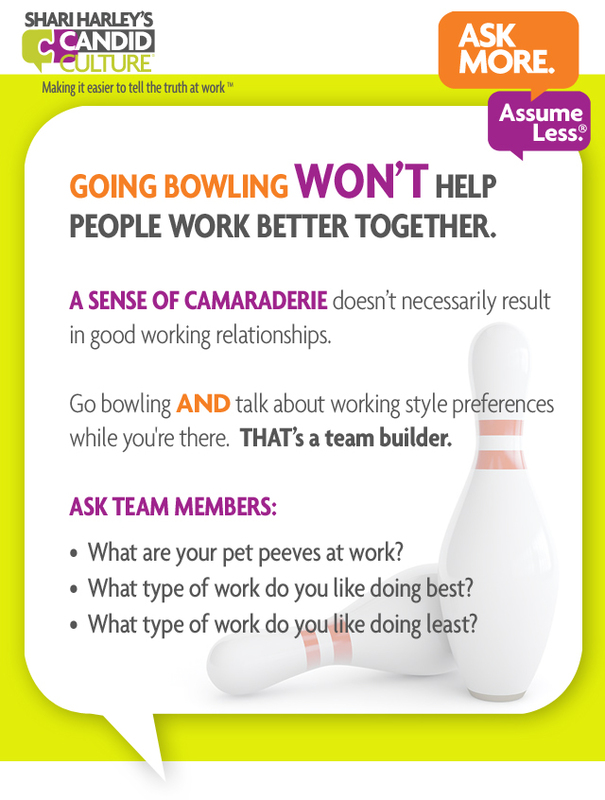 If you’re really committed to team building and working well with people, ask more questions at the onset and throughout working relationships. What are your pet peeves? How would I frustrate you and not even know it? Are you a big picture or detail oriented person? Should I send you information in bullets or paragraphs? What are you best at doing? What type of work could you be doing that you’re not doing now? What are you working on now? What are your priorities for the next six months? Your manager may coordinate an activity that gives your team the ability to ask questions like this, and s/he might not. Either way, ask the questions and be forthcoming if others ask you for this information. It’s not just your manager’s job to get your team working well together. Your daily experience at work – how much you get done, how easily you get that work done, and how much fun you have along the way – is largely dependent on the people you work with. Don’t leave your working relationships to chance. Be assertive. Get to know people better. Ask more questions and offer information about yourself. We added to our team at Candid Culture a few weeks ago, so we did what I teach other organizations to do –used Candor Questions to onboard our new team member, and help the entire team get to know each other better. I sent my team the Candor Questions below and asked them to pick a few additional team building questions for everyone on the team to answer. What will keep you working here and what would make you leave? What’s the best way to get information to you – voicemail, text, or email? What time is too early? What time is too late? Do you leave your email and/or text alerts on at night/when you go to sleep? Would you prefer I send all emails and text messages during regular business hours? What frustrates you at work? What’s something you want to learn, skill or business wise, that you haven’t had a chance to do? What’s something you wish I would start, stop, or continuing doing? How many times have you sent someone five emails and become frustrated when none were returned? Or you thought an employee was happy, only to be surprised when she quit? Or you needed to talk with someone but couldn’t get her attention, so you walked by her office throughout the day, wondering if it was ok to knock? Working with other people doesn’t have to be so hard. Taking the time to ask team building questions is much faster than recovering from missteps with other people. Ask the questions at the beginning of anything new – when you hire a new employee, get a new customer, or start a new project. And keep asking the questions as you work with people. Asking questions about working style preferences and goals is an ongoing process, and it’s never too late. You can ask the team building questions during meetings or just slip them into your conversations. The process doesn’t have to be formal or time consuming. The point is simply, don’t guess what people need and are expecting from you, ask. We added to our team at Candid Culture a few weeks ago, so we did what I teach other organizations to do –use Candor Questions to onboard our new team member, and help the entire team get to know each other better.